OLD PARKED CARS. 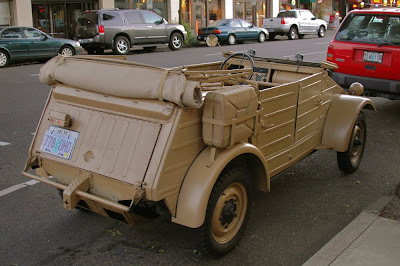 : 1943 Volkswagen Kübelwagen Type 82. 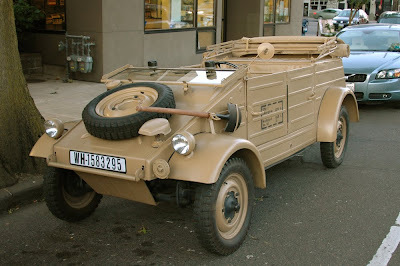 1943 Volkswagen Kübelwagen Type 82. The other cars just look plain boring with that parked there. fantastic find. the jalopnik "down on the street" blog seems to find a lot of military vehicles, but this is our first, i think, and it took over a year for some reason. 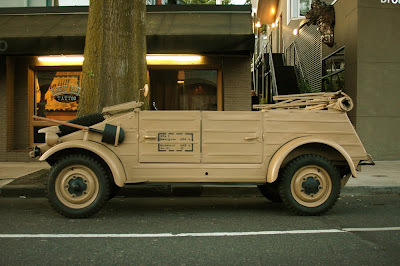 (although there was that rattle-can army green pickup.) what i really want to see--or rather, what i really want to own and drive every day--is a ww2 army jeep, with the windshield flipped down. the fact that this one has the top and the windshield both dropped warms my heart. i love the wikipedia entry on "jerry cans," btw. serious about the jeep, btw. I really dig these details. 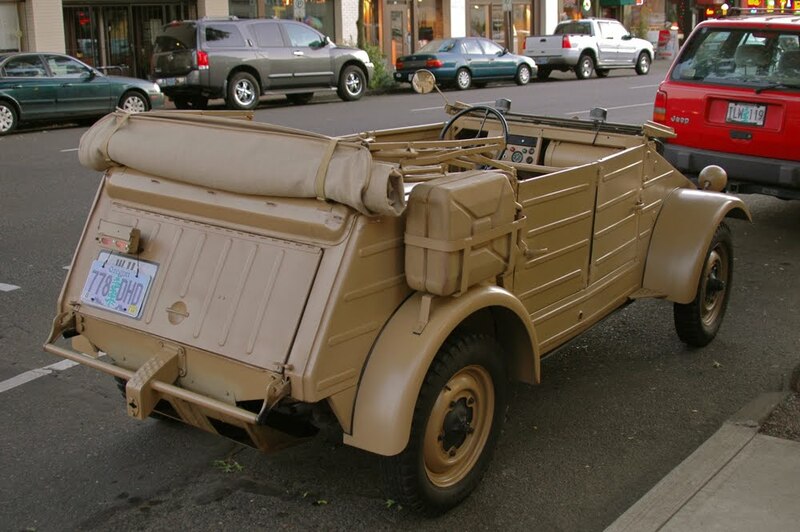 In November 1943, the U.S. military conducted a series of tests as well on several Type 82s they had captured in North Africa; they concluded that the vehicle was simpler, easier to manufacture and maintain, faster, and more comfortable for four passengers than the U.S. Jeeps. This statement is at odds with U.S. War Department Technical Manual TM-E 30-451, Handbook on German Military Forces, dated 15 March 1945. In this manual (p. 416), it states "The Volkswagen, the German equivalent of the U.S. "Jeep", is inferior in every way except in the comfort of its seating accommodations. There aren't too many left anymore. Rommel went inside for a beer.